I hope everyone had a wonderful weekend. We spent a majority of it watching football (hubby) and studying for my upcoming boards (me). I have to say there's something cozy about studying at home with a fall candle burning...oh and sipping on my first PSL of the season (be sure to follow me on Insta HERE to see all the fall fun! haha!). My count so far this season is 2. I try to save on the cals by getting it without whip cream and low fat milk. I like to pretend that this is a little "healthier" for me, if I'm wrong I don't want to be right because PSLs are just that good! lol. Anyway, on to this outfit! 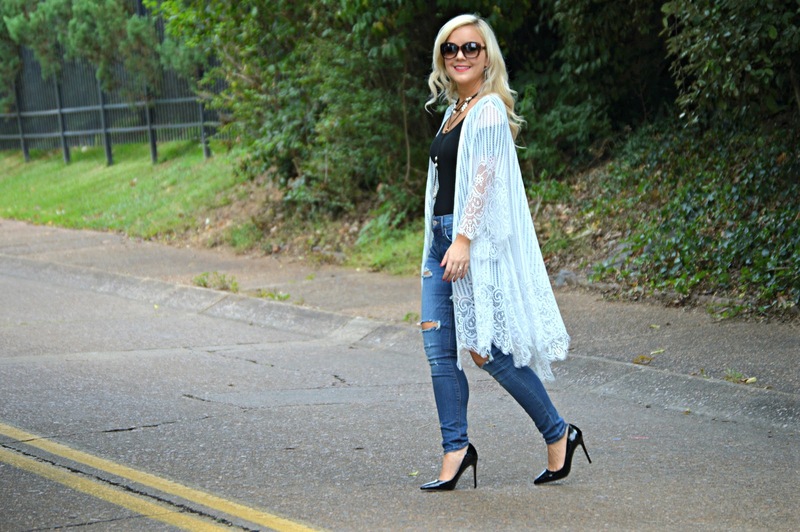 I am in LOVE with dusters/kimonos for fall (or for any season, to be honest). The one I'm wearing above is my ideal version because it has LACE which is so feminine, flirty, and romantic. Not to mention that I just love the movement of this piece in particular! Dusters are super versatile too because they come in different lengths so no matter your height, you are sure to find the perfect, most flattering one! I just bought this Gianni Bini one a couple of weeks ago but I unfortunately cannot find it online. However, I have linked some CUTE affordable options in the widget below so be sure to check out my faves for this fall. So you may be asking, how do you style a duster anyway? 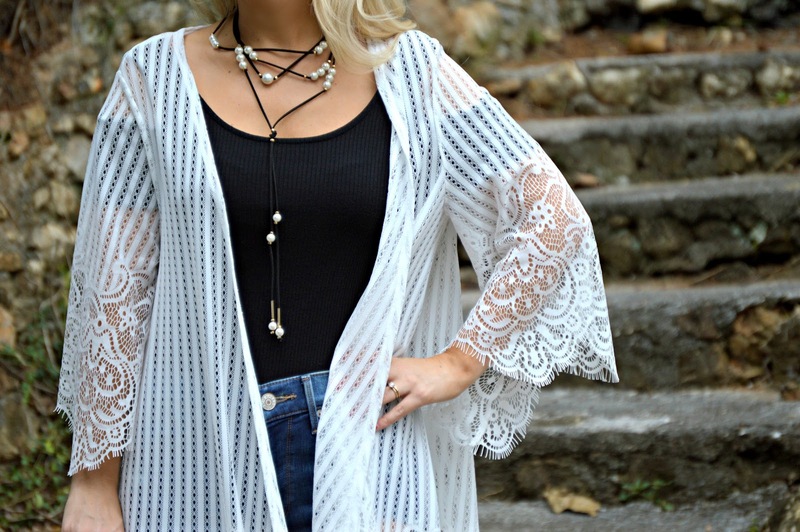 This is a perfect layering piece so it really can be styled SO many ways. Some of my faves include wearing it with jeans as I have above, pairing it with shorts or a skirt, OR wearing it over your favorite dress/romper/jumper (check out how I styled it with my fave jumper HERE). The key is to keep your under layers a little lighter weight (i.e. I wouldn't pair this with a huge sweater) because you don't want the duster to look too bulky to keep the light, flowy look going. In my #ootd above, I paired it with a bodysuit which provided just the look I wanted! Also, I just wanted to say that my thoughts and prayers are with all of those who have been affected by the recent hurricanes. We were so heartbroken to hear about the devastation in Texas, and then to learn of Florida being hit hard with Hurricane Irma this weekend was also just so sad!! We have SO many fond, beautiful memories in Key West, FL, as we spent our first week as husband and wife in this gorgeous paradise. We hope and pray for all of those affected!!! !